I don’t normally find that sewing clothes is any cheaper than buying them, but this project is one of the exceptions. The pattern is one I’ve made several times before: a modified version of the skirt from Vogue 1247 (previous versions: green, silver knit, grey). The fabric is the scraps left over from my silver jeans. I had plenty of suitable top stitching thread to go with it left too. The technical drawing for the pattern is below but my version has some changes. I am trying to use more things from my stash, and amongst my zips I had a metal one of about the right length with a large silver decorative puller. It was a good match for the fabric but there was no way I wanted the puller digging into the small of my back, so I moved the zip to the side seam. The puller meant it had to be installed as an exposed zip. I used a lot of Wonder Tape to hold the zip in place while I stitched it because you can’t pin or baste this fabric anywhere it might show! I wasn’t sure what to do about the waistband. 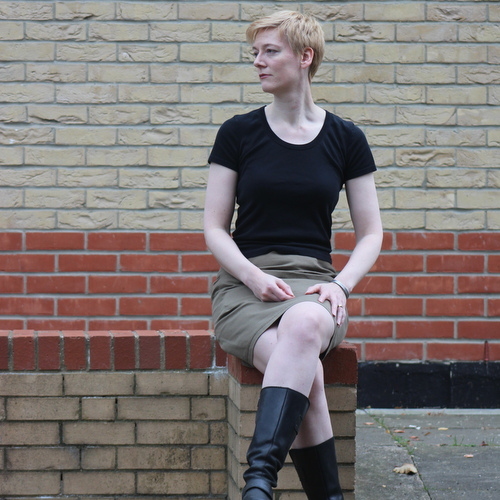 Previous versions I’ve made of this skirt have an invisible zip which stops just below the waistband, and a hook and bar closure on the waistband itself. I couldn’t find a picture of an exposed zip installed like that, but I was worried that it wouldn’t stay closed without the help of an additional closure at the top; the waistband is close fitting and so takes a lot of strain. In the end I stopped the zip just under the waistband and made a small overlap on the waistband with a hook and bar to hold it. Seems to work and looks fine. Another change I made was to add a centre front seam and top stitching along it and the yoke seam. The front of the skirt is very plain and I thought it needed something to break up the expanse of shiny silver. Here’s a back view. Yes it needs pressing, but on the other hand this is how it really looks after I’ve been sitting down. The reason I keep going back to this style is the pockets. They are well placed and nice and big. I’ve got my purse, keys, and phone in them in the modelled photos. I had a lot of trouble figuring out how to style this. I thought black would look too stark against the silver and so tried various grey tops and tights, but they all looked wrong. It would probably work with a white top and bare legs but the UK is well into autumn now so that’s not going to be an option for a long time. The black top and tights seems to be the best option. Modelled photos taken by my husband; flat ones by me. I always seem to overestimate how much fabric I need for any project and end up with a piece left over that’s too big to throw away but too small to do a lot with. The skirt from Vogue 1247 (sadly now out of print) is a great use for such leftovers. I got this one out of a 70cm length of 150cm wide grey denim left over from my Burda 115 12/2009 trousers. Come to think of it, exactly the same thing happened with the leftovers from my previous version of those trousers. The denim was from Truro Fabrics but is now sold out. Here’s the line art. I have never made the top, but the pattern is worth tracking down for the skirt alone. It is a simple style but beautifully implemented. Most importantly, it has pockets! And they are not an afterthought but an integral part of the design. Incidentally I’ve just noticed that the line art of the back view has a mistake. The zip doesn’t actually run to the top of the waistband. Instead the waistband has an underlap and closes with a hook and bar. The zip stops just below it as you’d expect. The original skirt pattern is seriously short. My version is lengthened by something like six inches. Admittedly I’m pretty tall but I don’t normally have to add length below the waist on any Vogue pattern. The original also has next-to-no ease. If you’re making this, check the finished garment measurements before picking a size; I found I needed to go one bigger than I usually do. 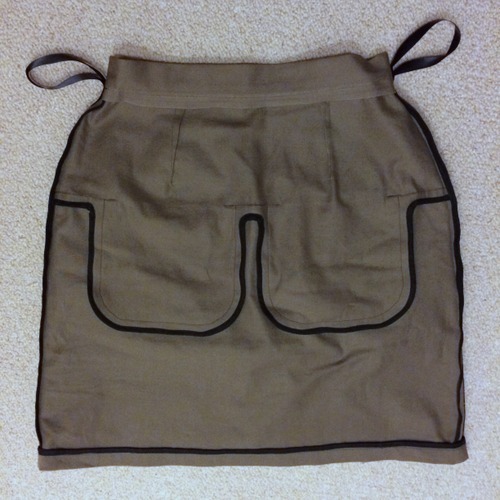 The original skirt has seams finished with bias binding throughout. It’s a beautiful effect but very time consuming to do. It’s much quicker to line the skirt than bind all the seams and in fact I prefer it lined. The first time I made this pattern I did the bound seams but that version of the skirt sticks to my tights and rides up. The lined versions don’t. This one’s lined with a large scrap of black satin lining I had left over from another project. I think it might be The Lining Company’s acetate/viscose satin. I also used the lining fabric for the front pocket bags. The back pocket bags were cut out of the denim. The original pattern has the back pocket bag pieces cut in one with the skirt yoke but I cut them separately to save fabric. I also interfaced the front yoke just above the pockets to try to avoid any sagging and it seems to have worked. I added some yellow topstitching to this version of the skirt. It’s just about visible in the photos. The grey denim needs the extra interest. I topstitched the yoke seam on the panels before inserting the zip or sewing the side seams so I had to be very careful about matching the topstitching lines up afterwards. Later I realized that I could have done it the other way around, sewing one continuous line of topstitching around the yoke starting and finishing at the centre back zip after I’d put the skirt together completely. This would probably have been easier to do. The eye is drawn to the topstitching and not the seamlines so it also would have disguised any failure to match the seamlines precisely at the side seams and centre back. I expect I’ll make another version of this pattern any time I have a suitable leftover piece of fabric. The pockets are nicely roomy, it’s comfortable to wear, and if you skip the seam binding it’s a pretty fast sew. Vilene H250 interfacing on waistband, zip seam allowances, and front yoke above pockets. It was probably too heavy for the zip allowances. This pattern is Vogue 1247; a Rachel Comey design that’s been on my mental to-sew list for a while. I’ve seen so many great versions of this made up that I expected Vogue would be selling the pattern forever, so it was a big surprise to see it in the “out of print” section on Sew Direct recently. Here’s the line art. I hastily bought a copy before it became completely unavailable, only to discover that it calls for finishing all the seams in the skirt with bias binding. At first I thought I’d ignore such fiddly nonsense and overlock the seam allowances instead, but then I noticed the right angle internal corners between the pockets! Attempting to feed those through the overlocker sounded like a recipe for disaster, so I reluctantly dug out a roll of black cotton bias binding and set to binding seams. I couldn’t even use my faithful binding foot as it doesn’t work well on sharp corners. I did manage to save myself one bit of extra work by cutting the waistband edge on the selvedge of the fabric so at least I didn’t have to bind that edge. And it does look really nice inside if you don’t look too closely at the corners. This skirt is seriously short. I added five inches to the length and made a one inch hem instead of the two inch one in the pattern. I’m tall, admittedly, but I wouldn’t want it any shorter than it is. I also think this one is a bit more true to size than some Vogue patterns; there’s not a lot of ease built in. If like me you’re in the habit of always going down a size in Vogue without really thinking about it then make an exception for this one. Luckily I checked the finished garment measurements before cutting; I ended up making my true size for once. I really like this pattern. Unusually for me I’d worn the finished object quite a few times before taking photos. The pockets are huge and it’s very comfortable to wear despite having a high waist. I can cycle in it (with thick tights or leggings underneath) too. And for once I’m pretty sure I will make it again because I’ve already cut another one out.